Welcome to the Evosep Literature Room, your shortcut to our knowledge base. Here, you can find the latest material presented by Evosep and our collaboration partners and also discover older publications and videos. Get a better understanding of the applications and technology of Evosep One, a separation tool designed for clinical omics. By employing innovative sample processing and analysis strategy, the Evosep One offers new perspectives to drug testing laboratories thanks to high sample throughput without compromising sensitivity. 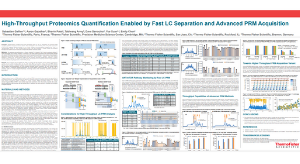 Evosep One has been designed specifically to address and eliminate the prevalent challenges associated with throughput and robustness of nano-flow LC-MS workflows while maintaining sufficient sensitivity and resolving power for clinical omics applications. 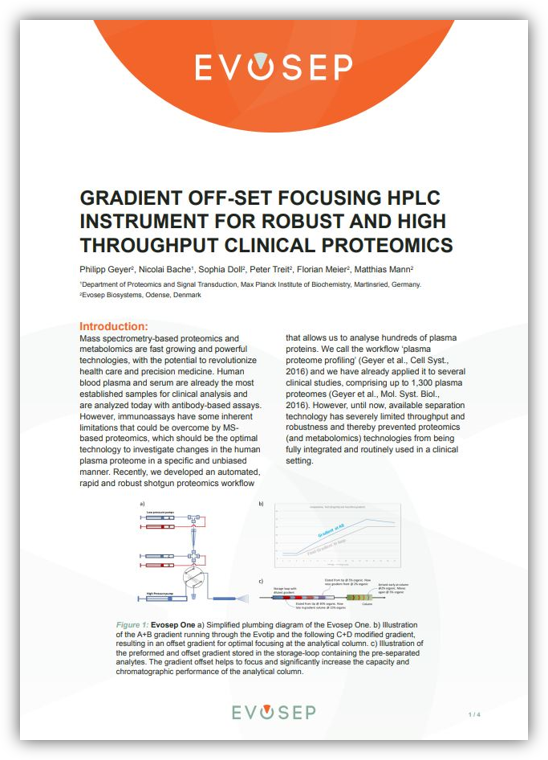 Implementing the Evosep One– a ‘gradient off-set focusing HPLC instrument’– into the workflow at the Max-Planck Institute removed a major hurdle to establishing proteomics as a standard diagnostic method. 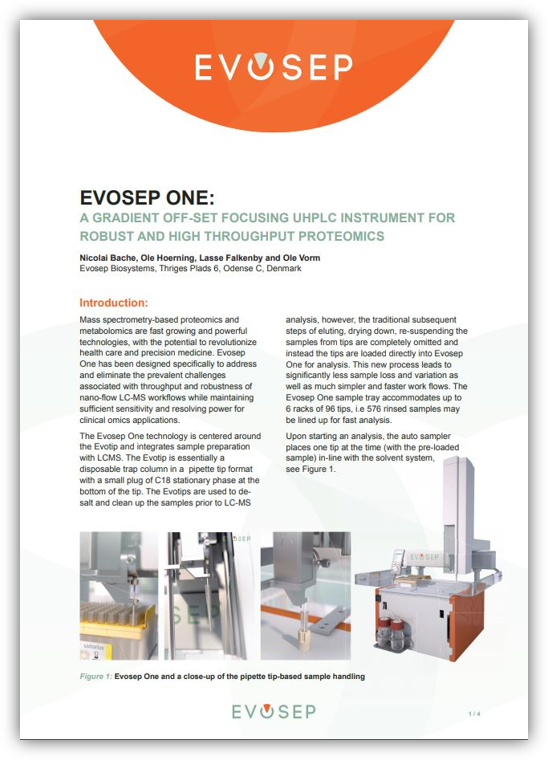 Until now, available separation technology has severely limited throughput and robustness but the Evosep One dramatically increases robustness and sample throughput while maintaining the sensitivity of current nanoflow LC instruments. 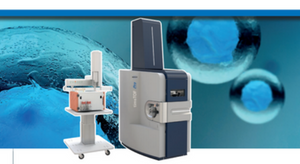 Evosep One is designed for sensitivity, throughput, and robustness – tailored for large clinical studies. 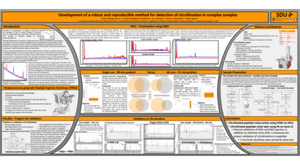 Learn more about our instrument Evosep One, a separation tool designed for clinical omics. The Evosep One is an optimized front-end to a mass spectrometer for large-cohort experiments. Watch the video to get a quick overview of the instrument. This paper presents a novel concept that opens entirely new possibilities in proteomics in general and in clinical proteomics. 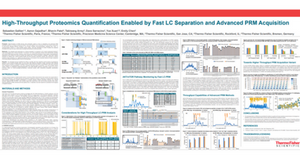 With a simplified design it enables a robust operation over thousands of sample injections and analyzes samples in an extremely robust and high throughput manner, without sacrificing in depth proteomics coverage. 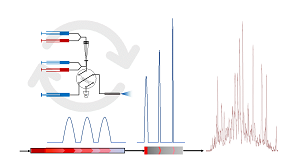 In bottom−up proteomics, peptides are separated by liquid chromatography with elution peak widths in the range of seconds, while mass spectra are acquired in about 100 microseconds with time−of−fight (TOF) instruments. 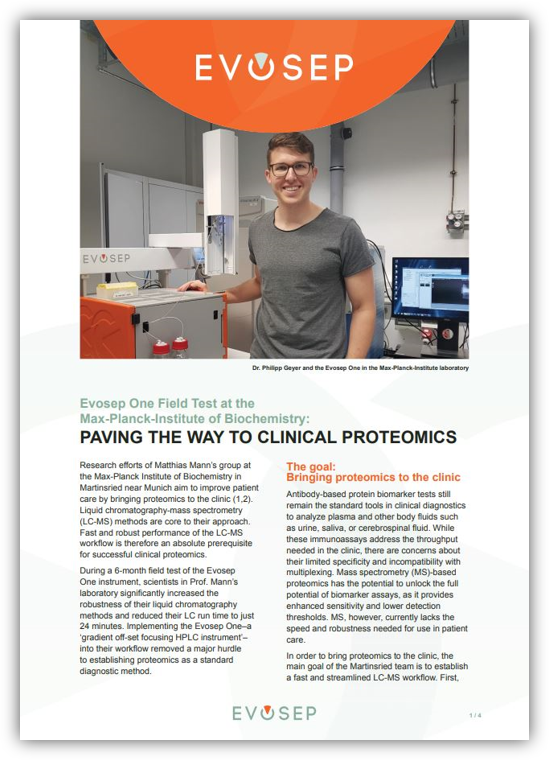 To support proteomics studies the Evosep One combined with Thermo Scientific™ Q Exactive™ are used to develop High-throughput LC-PRM set-ups based on fast LC separations and advanced PRM acquisition schemes. A novel IS-PRM method variant was also developed to further increase the analytical throughput and open the way to fast broad-coverage/multi-pathway monitoring studies. While good analytical depth is currently achievable in (MS)-based proteomics, the throughput required in screening or clinical applications is not achievable with traditional nanoESI LC-MS/MS systems. Combining the Evosep One with low overhead times and the timsTOF Pro with the fast PASEF acquisition method (Meier et al., JPR 2015). 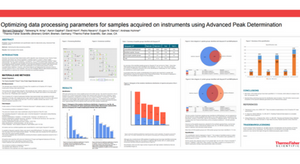 We show highly reproducible identification and quantification with low sample amounts over ~100 runs, demonstrating the potential for high throughput applications. Here, the high speed of PASEF, (parallel accumulation and serial fragmentation) as implemented on the timsTOF Pro, coupled with the Evosep One LC system were used to detect HCPs using a 21 minute gradient. As the protein concentration in plasma is so high (50 μg/μl), a simple fingerprick delivering just 1μl of plasma is enough to analyze the human plasma proteome. An initial separation by traditional LC using HFBA as ion-pairing reagent followed by short LC-MSMS separation on an EVOSEP system is compared to a traditional LC-MS/MS setup, with the aim of developing a system, where specific ion pairing reagents are used to separate arginine, containing peptides from equivalent citrullinated ones. Mass spectrometry based proteomics and metabolomics are fast growing and powerful technologies, with the potential to revolutionize health care and precision medicine. 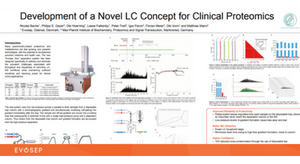 Here we describe a conceptually novel low-flow chromatography system, that delivers the robustness and throughput required for clinical applications while maintaining the sensitivity of current nano-flow LC instrumentation. Depth of coverage in shotgun proteomics workflows is usually achieved by high resolution nano-LC peptide separation, coupled to ESI-MS/MS. While good analytical depth is currently achievable, reaching the throughput required to analyze hundreds or even thousands of samples needed to obtain sufficient statistical power for biomarker validation studies, is unachievable with traditional nano-ESI LC-MS/MS systems. Thermo and Evosep’s data from the joint use of the Evosep One system and Thermo’s QExactive mass spectrometers. 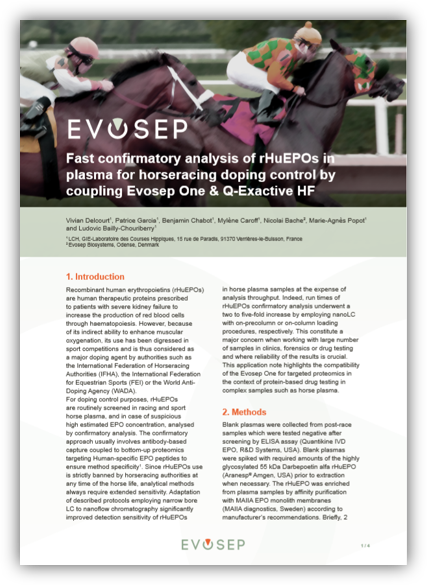 The samples were measured using an Evosep One coupled to an Q Exactive HF-X Hybrid Quadrupole-Orbitrap mass spectrometer, and the Evotip technology improves overall system throughput and robustness by reducing column clogging and carryover. The recent release of Evosep one, has changed the game, ceasing the need for concatenation and cutting MS analysis time in half. The results presented here demonstrate combining the timsTOF Pro and the Evosep One, for the first time enables high-throughput measurements while maintaining analytical depth. At the 15th Annual Conference of the US Human Proteome Organization, Bruker announces further progress in high-sensitivity, high-throughput plasma-proteomics using the timsTOF Pro mass spectrometer connected to an Evosep One low-flow chromatography system. Biognosys and Evosep jointly announced a high-throughput workflow for clinical plasma proteomics that combines Biognosys’ PQ500 plasma protein panel, which quantifies 500 proteins using DIA mass spec, with the Evosep One liquid chromatography system. With the release of a Bruker plug-in to control the Evosep One LC system, Bruker and Evosep now announce a co-selling agreement, which enables Bruker to sell, support and service a complete solution for proteomics labs requiring extreme throughput, sensitivity and robustness. At the 17th Human Proteome Organization World Congress, Biognosys and Evosep jointly promote a robust, high-throughput workflow for clinical research proteomics. Researchers from the Max Planck Institute of Biochemistry, University of Copenhagen, and liquid chromatography firm Evosep Biosystems have developed a mass spec-based proteomics workflow capable of running more than 200 samples per day. In their press release at the 66th ASMS Conference, Bruker announces full integration with the Evosep One separation device with Bruker’s Hystar LC/MS control for high-throughput clinical proteomics of up to 200 samples per day. This novel combination delivers superb sensitivity (50 ng HeLa) and high throughput for LFQ of ~1,200 proteins in only ~5 minutes. To further increase throughput, Mann and his colleagues combined the timsTOF Pro with the Evosep One LC system, which uses a preformed gradient to improve assay robustness and cut downtime between injections. 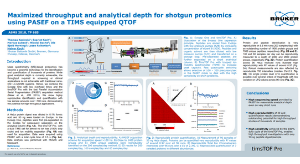 journal of integrated omics: shotgun proteomics: where do we stand now? Making a sample ready for shoutgun proteomics analysis has always been a timeconsuming operation. However, new techniological advances in chromatpgraphy are called to change the panorama dramatically. At the 2018 US HUPO Conference, Bruker and Evosep announce that they have executed a co-development and co-marketing agreement for the Evosep One chromatography system to work seamlessly with Bruker’s timsTOF Pro ultra-high resolution quadrupole time of flight mass spectrometer. At Pittcon 2018, Bruker this week will highlight various innovative analytical systems and new high-value solutions – Bruker’s revolutionary timsTOF Pro mass spectrometer for high sensitivity proteomics can now be integrated with the Evosep One separation device for high-throughput clinical proteomics. 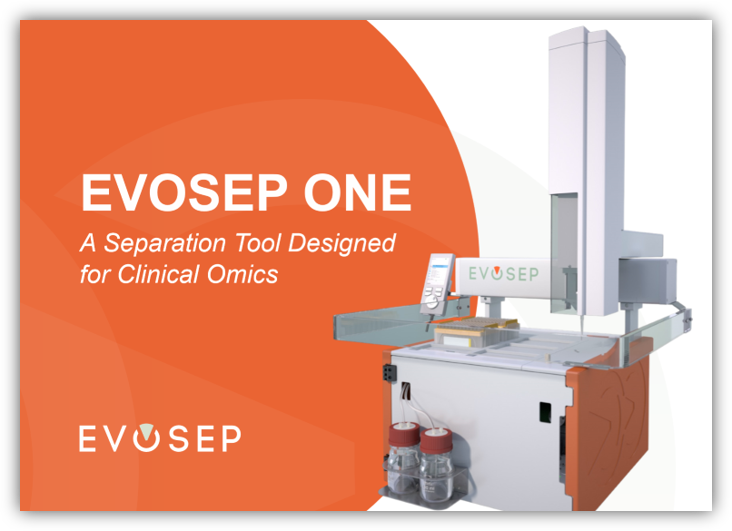 Today, the Evosep One is introduced, a novel separation solution designed for fast and robust separation of omics samples in large clinical cohort studies (primarily proteomics and metabolomics). 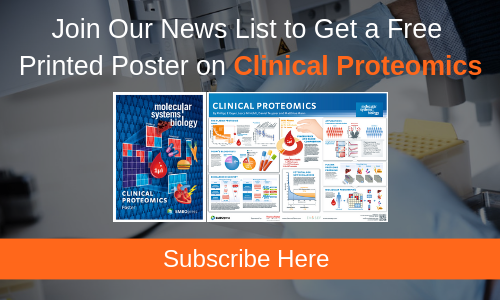 Watch seminars from conferences and experts giving their view on clinical proteomics. Evosep EuPA Lunch seminar 2019: Talk by Dr. Ben Collins, Group Leader at ETH Zurich. Hear about how our customers are getting more productive and successful with our instruments. Webinar on Fast HCP Screening with Evosep One and timsTOF Pro. Breakfast seminar at ASMS 2018 by Prof. Jesper Olsen from Novo Nordisk Foundation Center for Protein Research in Copenhagen. HUPO 2017 LUNCH SEMINAR ON CLINICAL PROTEOMICS, Part 1. HUPO 2017 LUNCH SEMINAR ON CLINICAL PROTEOMICS, part 2. The Evosep One is an optimized front-end to a mass spectrometer for large-cohort experiments. Associate professor Dan Holmes is a medical doctor and Division Head, Clinical Chemistry, St. Paul’s Hospital in Vancouver. “Robust Front-End Solutions for Clinical Proteomics”, talk by Dr. Ole Vorm, Founder and Director, Evosep. Dr. Conrads explains how clinical proteomics can improve cancer treatment with early detection, molecular diagnosis and increased precision. Professor Phil Robinson from ProCan in Sydney. Do not hesistate to contact us with any questions or comments you might have at sales@evosep.com.